the opening you have created. So, your stamped image is going to be inside your card. This is a beautiful stamp from Northwoods Rubber Stamps. 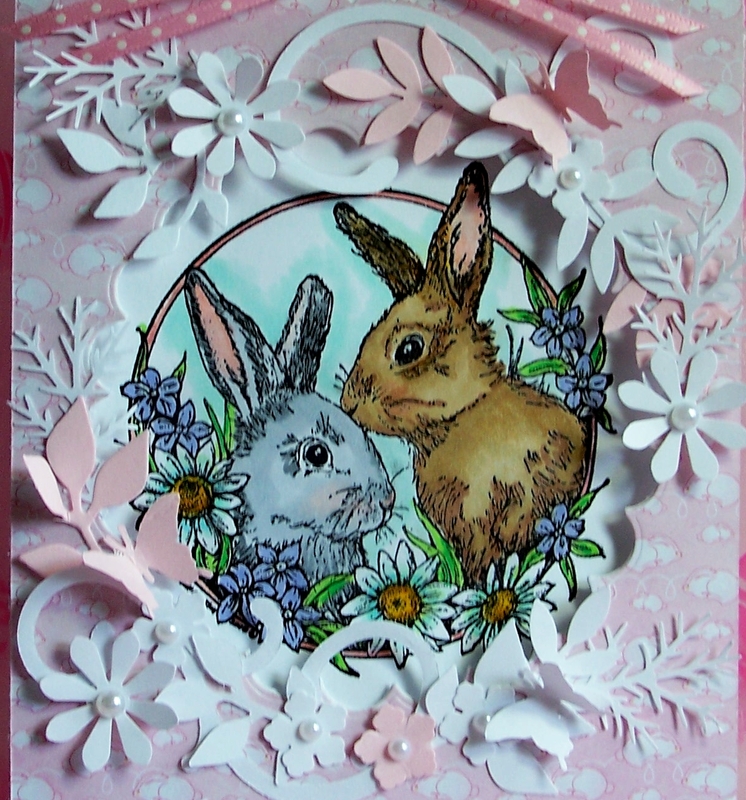 a piece of designer paper (Bunny Love 6x6 stack). I cut the designer paper to 5" wide. designer paper at the same time, so that the opening is in the same place on the front of the card. 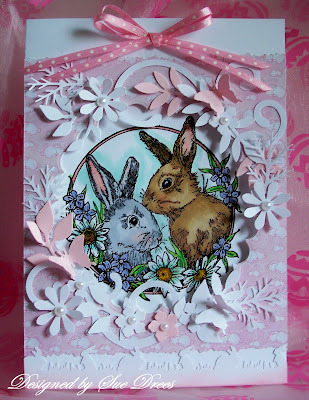 The bunny punch at the bottom of the card is Martha Stewart. Now for the fun. I pulled a bunch of punches and Sizzix dies out and punched swirls, flowers, branches and leaves out of white and pink paper. Then, I glued them around the Aperture opening in a pleasing design. Be sure that you only glue small areas and they don't go over the edge of the cut out. This is so much fun, and it is hard to stop once you get started decorating. It adds such a lovely softness to the opening. this image is very cute, your card is very beautiful sue. Wow Sue this is gorgeous! Ohh new banner Sue, very lovely. So gorgeous Sue,I love the image and the colours. What an elegant card! Your coloring is just so perfect. I just might have to think about this design\??? I visited BS&S last week and fell in love with her screen door sets. The dies were made special for the store!! Have you seen them? 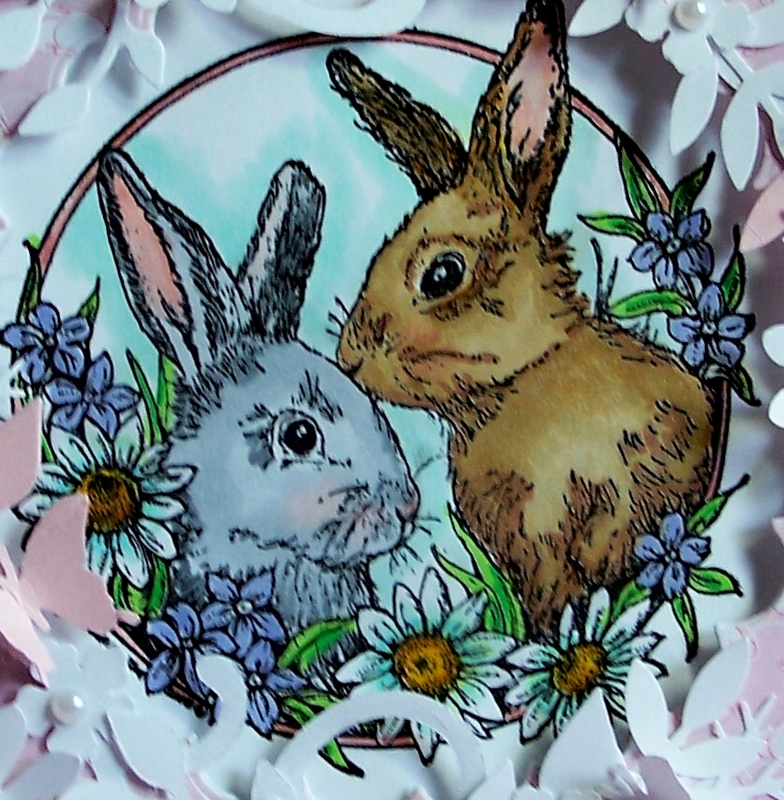 awww, youve colored these bunnies beautifully.